July�s been a bit busy � lots of traveling for work � but I wanted to post about the settlement agreement between the United States Postal Service (USPS) and OSHA in July. Thanks to Fierce Government for the initial information and link to the settlement document. USPS received seven willful violations for a facility in Providence, RI, but the remainder of the violations from inspections over the last few years at 42 facilities were re-classified as part of the settlement agreement from �willful� to �serious.� USPS has entered into an �enterprise-wide� compliance agreement with OSHA regarding its electrical safety work practices and written programs. Energized electrical work includes troubleshooting and voltage testing, but these can only be conducted when equipment is energized, so the prohibited work does not include these tasks. 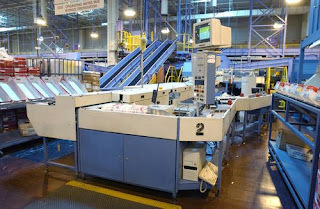 According to Fierce Government, �USPS will assign a trained electrical work plan coordinator at each facility and require the use of electrically protective gloves and full body arc flash protection for energized work, including voltage testing.� Only qualified USPS employees are permitted to conduct energized work using the proper personal protective equipment (PPE). Affected USPS employees (i.e. those not qualified to do electrical work but will be working in close proximity to someone who is conducting energized electrical work) are also required to receive OSHA compliance training for recognition of electrical safety hazards and other topics as identified in the Training Implementation Plan. Courtesy of the Smithsonian Institution's National Postal Museum, enjoy some pictures of how mail processing was done circa 1945 and how it is done now. Mail processing circa 1945 in the Post Office Department - image courtesy of Smithsonian Institution. 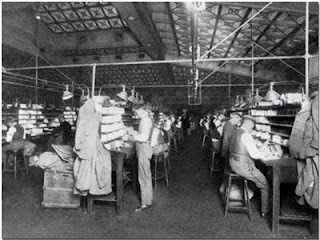 Mail processing as it occurs today in Processing and Distribution Centers throughout USPS - image courtesy of Smithsonian Institution. It's amazing to see what technology can do, as far as improving processes and. Courtesy of the University of Delaware Physics Department, here are some intriguing quotes about technology and its effect on modern life.